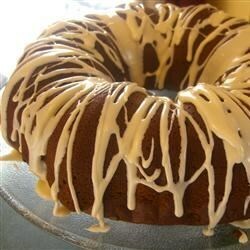 "This cake is moist with applesauce, is full of raisins and pecans. This is a chocolate cake for all you chocolate lovers. This cake has no eggs and is especially dense." In a bowl, cream the butter or margarine with the sugar. Beat in the milk, applesauce, and 2 tablespoons of rum. In another bowl, stir together the flour, cocoa, baking soda, spices, and salt. Beat into the creamed mixture and then stir in the raisins and pecans. Turn the batter into a greased and floured 9x13 inch baking pan. Bake the cake in a preheated 350 degrees F (175 degrees C) oven for 45 minutes, or until it tests done with a toothpick. Immediately after removing the cake from the oven, sprinkle it with the remaining 1/4 cup rum. Let cool on a rack. This cake improves if allowed to sit for a day or so before eating. Serves 20. This recipe was brilliant .It is ideal for those with an egg allergy ,it is quick to make, delicious and it was enjoyed by all memmbers of my family. Quite unappealing. It took forever to cook, and the edges burnt to a crisp before the centre was cooked. I'll never make it again. This cake had just the right amount of sweetness! I only put in half of the margarine, about 1/4 c less of applesauce and omitted the nuts and the 1/4c dark rum. Made a nice 9" round cake. Wow!!! This is one very tasty applesauce cake , than you Carol.